The Vietnam Business Council for Sustainable Development (VBCSD) has signed an agreement with three foreign-invested enterprises to implement the “Zero Waste to Nature” initiative. It is part of a program aimed at supporting enterprises to participate in the circular economy. The three companies involved in the initiative are Unilever, Coca-Cola and Down Chemical. Experts have stated that a circular economy will help reduce the risks from the scarcity of resources in the future, address environmental issues and add US$4.5 trillion to global GDP by 2030. In a circular economy, waste will be regenerated in various forms and reused in the production process instead of being discarded and causing environmental pollution. VBCSD Secretary General Nguyen Quang Vinh said the “Zero Waste to Nature” initiative aims to address the issues arising from plastic waste and promote sustainable business models. 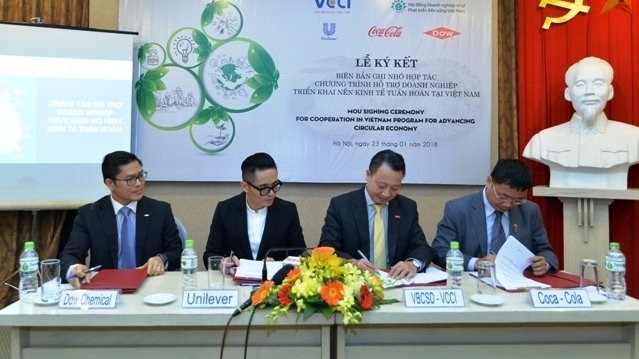 At the signing ceremony, Unilever Vietnam chairwoman Nguyen Thi Bich Van pledged that all of the company’s plastics packaging will be collected, recycled and reused by 2025. Meanwhile, Coca-Cola will support the collection and recycling of all plastic bottles of its products sold to the market by 2030, said Sanket Ray, chief executive of Coca-Cola Vietnam.